Sioux and Duke and Aidan arrived late the next Friday night, this Friday just past—in fact, it was barely still Friday. They were staying for the weekend while they checked out their recently robbed home. We stayed up til 1:30 chatting over the requisite cava. My guest room is in the front of the house, and all three guests were sleeping in there, Aidan on the floor. In the wee hours I heard the firehouse siren go off, but that isn’t unusual. I fell back asleep. In a half-slumber, I heard a lot of traffic passing the house. It was odd—more vehicles passed in an hour than usually do in a day. If no one had been in the guest room, I may have stumbled into it and peered out the window. But people were sleeping in there. At least, I hoped they were sleeping. I was feeling bad that they had to listen to traffic that never ever happens. I couldn’t push my thought processes beyond that in my semiconscious state. Tim and I were trying to force ourselves out of bed to be decent hosts when the phone rang. And it wasn’t til I heard my friend Dan’s voice ask what was going on in Parts West that I realized something was very wrong. He said he’d heard the store burned down. That it was gone. We had in fact all planned to walk there that very morning and pick up some scones or something for breakfast—something fast so that Sioux and Duke could get over to their house quickly. All that traffic was fire truck after fire truck heading down the road to Angela’s ponds to fill up with water: down and back, down and back. We went downstairs to get the coffee going and to put together a breakfast plan. We broke the horrifying news to our guests. Aidan, as soon as she was up and dressed, ran next door to be with her BFF Kristina, whose mother Lynda called as soon as she heard the news. We decided to all walk down together. I think we did that before breakfast. But it’s kind of a blur now. The store is only about ten buildings north of where I live. It’s amazing we slept through it. It was a cold and sunny day, very blue sky. When we walked out, we couldn’t see any smoke at all, but we could smell it. Sioux, Lynda, the three kids, and I walked down. I stopped at the post office to get as much info as I could. Will and Eric, who were living above the store for the winter, were going to be OK, but they’d had to jump from the second floor. They’d been taken to the hospital. Will had some smoke inhalation, Eric some burns. One of three dogs got out: Molly. The fire had started in the building next door. Later we found out a man had died in that small building, a building with no heat, electricity, running water. A local person taking temporary shelter there. More tragedy. The store is completely gone. We are all devastated. And I don’t think I can write any more about it. (If you haven’t read it already, see Lali’s eloquent post.) My heart breaks for all of us with the loss of this place. It breaks even more for Will and Eric. It took a couple of seconds for what I was seeing to register in my brain: I had just put a key into a lock in a door that had one of its windows knocked out. Someone else had been here. Someone had broken in. Weeks and weeks ago, Sioux asked me to stop at her house and take a picture of a chair. Our neighbor Roy had reupholstered it, and he left it in her back room, and she hadn’t seen it yet. She’s a summer person. As a summer person, she shuts the house for the winter—no water, no electricity, no heat, no phone. No plowing, either, which isn’t always such a big deal, but this year, it was. There was no easy way to park near her house. And the impassable driveway made it even more obvious, for an extended period, that no one was there. Earlier this winter, one of her neighbors had gotten broken into when he’d headed south. Since then, I’d been looking for footprints in her yard during drive-bys, but I never saw any. I told her I’d stop in and take the picture when the snow cleared. The night of the supermoon seemed like perfect timing. Tim and I’d watched many a moonrise from Sioux and Duke’s front porch, and maybe we could time things right to see it. Of course, what with that broken window, all plans for the evening immediately changed. We went in, and the place looked different, but the rugs were rolled up and the furniture covered. Sioux’s an artist, and there seemed to be almost no art in her studio, but she’d had a show in the fall and we figured she took it all with her. Whoever had been there had clearly been in the closets and drawers. Tim suggested we touch nothing, go home immediately, call the police. I was having trouble even making mental notes. Here’s a funny thing: I really didn’t know how to call the police. I mean, this wasn’t a 911 situation. I got out the phone book, and it was hard finding a listing, hard knowing what to look under, and then not being sure which number to call—the closer town is not in our county, the town in our county is farther away. I decided to find the annual town report to see if that had a number, and it had numbers for the constables and fire but not really the police. So I called Paul, now of Sioux-and-the-harp-case fame, who’s lived here a lot longer than I have, and he said to start with the constable. Then Tim and I tried to go out to dinner, couldn’t even get in the parking lot, so turned around, came home, and made a pizza. We talked to Paul a couple more times, who had by then talked with the police and then Duke, and then we talked with Duke, who was really quite calm about it. In the midst of all this, I would run outside and look for the moonrise. At some point that night or the next day, the cops must have made the trek to the house and made a report, but they never got back in touch with me or Paul. The next morning, Paul replaced the window, which is just the kind of guy he is. He took a look around and thought nothing obvious was missing. Sioux and Duke made plans to visit the next weekend to check it out. They would stay with us. It was upsetting. I felt guilty for not having trudged my way through the snow earlier. It’s hard to know how long ago the crime happened, besides less than a month before, when Paul had shoveled snow off the roof. It’s amazing the place hasn’t been robbed before, really, but this winter and this economy are especially grim. Whoever broke in had to have been disappointed in finding zero TVs, computers, stereos, cash. We went out again to look for the supermoon, but from our front yard there’s too much groundswell and house and trees blocking the horizon. As we were walking up the hill, trying to get some height, Laura pulled up. “Get in, I’ll take ya,” she said, and drove us down the road to the farm. There was the supermoon. I’d hoped to see it before it was that high in the sky, but it was big, and it was beautiful. Once, in an advanced grammar and composition class, my English teacher proclaimed that within five years, some of us would be married with children. I was a senior in high school, college bound, as were all of the people in that room, I thought. It didn’t seem possible that he could be right. But sure enough, a couple of months shy of her twenty-first birthday, a friend who had been sitting with me in that classroom gave birth to her first child. Cheryl was one of my best buddies during seriously formative years—ages 11 to 16 or so. She was brilliant. Immediately after high school, the government recruited her to study languages like Russian and Korean. I remember answering questions about her during her background check. Two years later, she was married and pregnant and then stopped working to raise her kids. Lately I’ve been reading Mali’s blog, No Kidding in NZ, which deals with both the pain of being unable to have children and the joys of a childfree existence. Within its electronic walls lies sensitivity training regarding choices and circumstances. Humans are a judgmental bunch, and all of us have our blind spots. I am childfree by choice, and one lesson I’ve had to learn is not to jump to the conclusion that other childfree couples are that way by choice. On some level, I’d make assumptions that, like me, they didn’t want children, and I’d decide we had this delightful fact in common. Then I’d say something that would turn out to be highly inappropriate. When she lived in LA, my sister joined the local chapter of No Kidding—a group made up of people with no children who wanted to socialize with other people who had no children. I was impressed that something like this existed. (Of course, there weren’t any chapters near me in Vermont, and I did not feel compelled to start one.) No matter. Sometimes I’m just happy that certain things are. Now, a quiz: How many children should you have? If you live in the United States and you answered (c) or (d), congratulations! You are correct! If you answered (a), you are obviously selfish. If you answered (b), you are practically a child abuser, not giving your only child a sibling. If you answered (e), really, what the hell are you thinking? My friend Esther, mother of one son, pointed this out to me years ago. It feels utterly, socially true. Mali’s last post deals with the alleged “selfishness” of childlessness, and I appreciate her addressing it. I’m always glad when parenthood is outed as a selfish act, because I can hardly think of anything more selfish—the need to pass along your genes, the need to create a family for yourself. What could be more about me than parenthood? I’m not saying this selfishness is wrong. (We all want to create our own happiness.) But it is selfishness. Certainly, being a parent pushes a person into situations in which s/he needs to be selfless sometimes. But necessary selfless situations aren’t exclusively limited to parenthood. Mali has also noted the use of the phrase, “As a mother, I . . .” or “As a parent, I . . . ,” as if parents had the monopoly on being compassionate human beings. Since she’s pointed it out, I’ve been hyperaware of it, and I do hear it a lot. What about “As a human, I . . . ?” Shouldn’t we all be compassionate? Why should nonparents be viewed as somehow unable to deeply care about fellow human beings, especially very young ones? There are plenty of reasons I’m happy that I didn’t have children. One is that it’s probably the best thing that I’ve done for the environment. Overpopulation is clearly the root of many of our problems. That said, the real reason I didn’t have children is that I just never wanted it enough. No matter what I think about overpopulation, I have no doubts that if I’d decided I wanted a child, I would have tried to have a child, the planet be damned. Like everyone else, I’m selfish that way. Do I like children? It feels like a false question. They’re people. Some of them are wonderful, and some of them are assholes. Most people, including children, are great most of the time but every now and again behave very badly. Here in Parts West, I’m surrounded by great kids. (I’m especially enamored of a 9-month-old and a 19-month-old at the moment, being almost physically unable to look away when either is in the room.) I like being around the kids in the ’hood. I like spending time with them. Then I like bidding them adieu and heading back to my childfree home. In case any of you (any of you who are not on Facebook, that is) were wondering if I turned a cartwheel on my birthday this year, the answer is yes, and here is the documentation. The photo was taken by Fat Red Ant, of course, who turns 49 today. I wonder if she’ll turn a cartwheel. She’s still nursing a months-old cartwheel-related injury that occurred in a crosswalk in Tokyo. Last weekend, while I was enjoying a getaway with my guy, I got an e-mail from my friend Sioux—an e-mail with the story of a startling coincidence. September through June, Sioux is a high school art teacher in Pennsylvania. Late June through Labor Day, she summers two miles down the road in a house attached to THE happy-hour porch and with land that accesses THE swimming hole. We work-all-year types are envious of anyone who can regularly use summer as a verb. That said, we love Sioux, so we are glad that she and her family summer here. I didn’t meet Paul until after I met Sioux and Duke, soon after they bought their house. I met them at a neighborhood potluck—they’d been invited when they met Rik, the guy who ran the dump when there still was a dump in Parts West. I must have met Paul later at Sioux and Duke’s place, most likely on THE happy-hour porch, but I can’t seem to remember the very first time. The first time they met Paul, he knocked on their door to welcome them. He had known the previous owners. They became fast friends. You know Paul. As noted previously, Paul’s the guy who sold his house to my sister, but still lives close by in a house with a perfect screened-in porch. He’s the guy born in Japan to missionary parents (in Sendai, in fact, hit hard by the earthquake and tsunami yesterday). He’s the crazy barefoot croquet player. He’s the guy we feared dead one night when our mutual friend couldn’t reach him. He’s the one who turned seventy last year, whose birthday dinner party was my excuse to keep my Christmas tree around a little while longer. He’s that guy on a camel in that photo in my living room. He’s the friend with whom I share an annual inaugural gin-and-tonic toast to summer—although it’s possible that sometimes this happens in April. So I get this e-mail from Sioux, now safely ensconced in Pennsylvania for the winter. She has a friend (nicknamed “Richard Gere”) who’s a contractor. Richard Gere often runs into people trying to get rid of stuff. Sioux uses lots of stuff in her art, so Richard Gere checks in with her to see if she’d want this or that. The two of them are thinking of collaborating on some furniture pieces and birdhouses made out of old stuff, and one of Richard Gere’s friends had this harp case hanging around, a harp case known as “the albatross” (it being huge and taking up a lot of space). Did Sioux want to see it? She did. 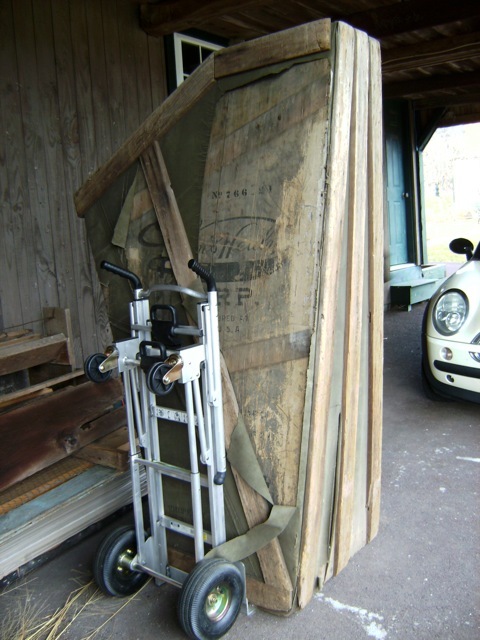 Sioux described the case as old and dingy and covered in green canvas. 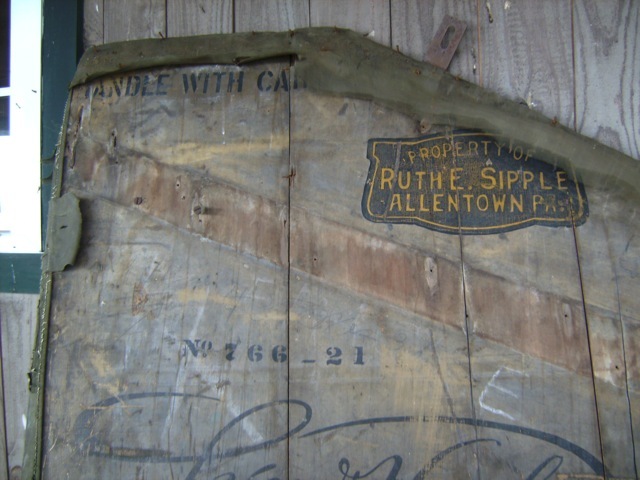 Stenciled in black on the canvas was the name Ruth Barber. 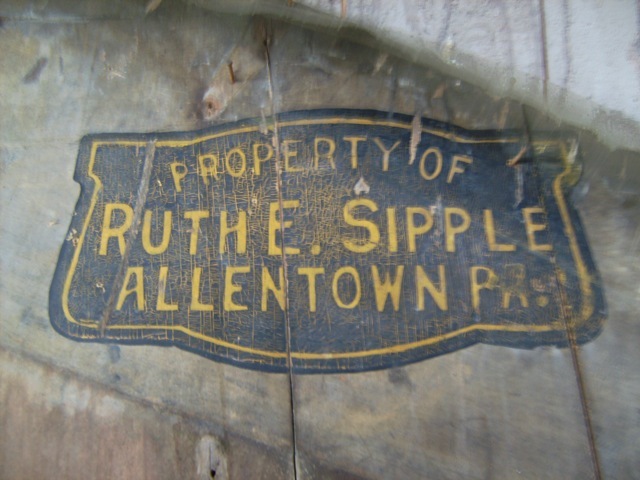 It turns out that Paul’s father’s father had a parish in Allentown, and his father’s sister played the harp locally for sixty years. 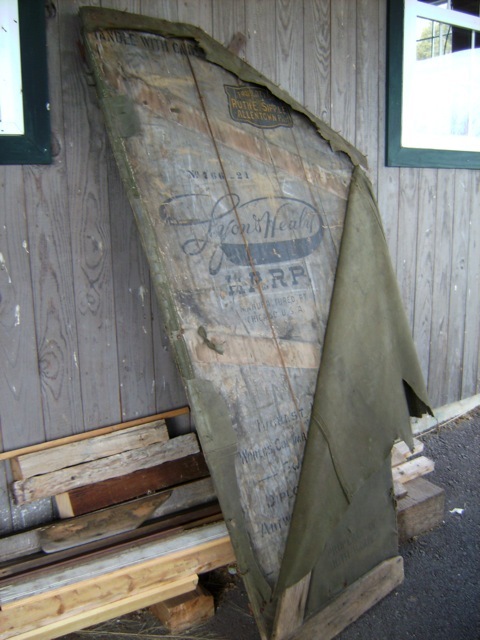 And now the harp case has fallen into the hands of a Pennsylvanian three hundred miles away who summers in Parts West a couple of miles away from the harpist’s nephew. Paul, who lives life computer-free, stopped by my place yesterday to take a look at the photos. The whole thing is giving us shivers. He left a photo with me to be scanned and sent to Sioux. It is Christmas 1947. Aunt Ruth the harpist is on the left with a baby on her lap; Paul, just shy of his eighth birthday, is the boy on the right, in front of his grandparents (click on the photo [and on any harp-case photo] for a better view). His dad, sister, and mom stand in the back, closest to the tree. 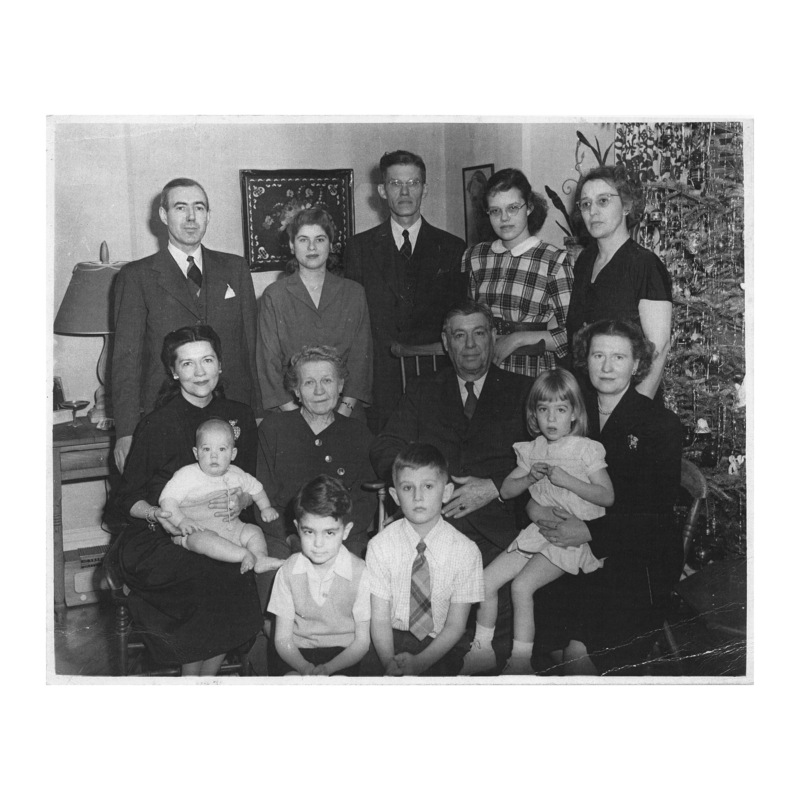 The back of the photo gives the date as Christmas 1948, but Paul has corrected it to 1947, because by 1948 they were back in Sendai, he says, after the war. A piece of family history discovered. A birthplace devastated. It has been a most unusual week for Paul. When I was offered a superpower—flight or invisibility—I chose flight, not only because I had perfected invisibility by middle school, but because I was a bird nerd with a dream. Like most people, I didn’t consider using my newfound power for good or evil. I thought only of myself. I wanted to fly. I wanted the speed I couldn’t muster in flying dreams. I wanted to fly with the birds. First: preparation. I get the cold-hands-and-feet thing. Add elevation and wind chill, and I knew I better be prepared: lots of layers and those chemical hand-warmer thingies. Second: performance anxiety. Where and when could I practice without being noticed? Remember, I don’t like to draw attention to myself. Big Flying Person isn’t invisible (although flying away could be part of an overall invisibility strategy). I couldn’t practice at night, of course, because, well, I don’t have enhanced vision. I don’t even have great vision. So I found some sparsely populated canyons. (Catching thermals with vultures is as awesome as you’d imagine.) I found big open fields. I practiced in crepuscular hours. And when fall arrived and Canada geese began to flock, I took off with them. First, I stayed at the back of the V. I had to learn how to move when they shifted positions, but this gaggle was surprisingly forgiving—not at all like the gym teachers of my youth. The views were spectacular. The air was cold, and I was grateful for my goggles and knit cap and lip balm. Eventually, the goose to my left looked me in the eye and motioned me forward. I stole a glance at the waterway and knew I could follow it. I pushed into the lead position and prayed to get through my turn before the river disappeared.